Marian Burtz never attended a prom in high school. The resident of the Winner Regional Longterm Care Center attended her first prom on May 18. The staff came up with the idea of hosting prom for the residents. Burtz was dressed in formal and was all smiles when she was introduced at the grand march. Burtz could not sleep the night before the prom because she was so excited. DeeAnn Woods, activities coordinator at Winner Regional, said the event was phenomenal. The activities room was decorated in pastel colors to go with the spring prom theme. There were lots of lights. The dining room and chapel were also decorated. Ryan Kindt, a CNA at Winner Regional, mentioned to Woods that it would be nice for all the residents to get dressed up. Kindt made the comment shortly after the Winner High School prom. Woods said it just clicked and she went into a planning mode and had lots of help from the staff. Prom dresses were donated by Once Upon a Story boutique of Sheridan, Wyo. The sister of a Winner regional employee owns the business. So, 50 prom dresses were given to the center and Woods was surprised to learn they did not have to be returned. The men wore button down shirts and ties. Each man had a boutinar and the women had a corsage. For the women, staff went room to room with makeup. Woods explained she fixed a lot of hair that day. Bob Vrbsky provided the music for the dance. There was a king and queen chosen. Bob Hansen was the king and Emma McKee was the queen. 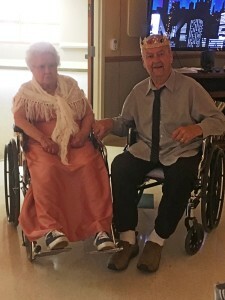 Woods noted the special care unit had its own king and queen with Bill Brodrecht as the king and Mae Arcoren as the queen. Woods said there was excitement all week leading up to prom. “The best thing was the smiles,” said Wood. “You could see how happy they were,” she added. Woods said the prom was so successful that it will be done next year.